Receipt Bank partner Stacey Price runs Healthy Business Finances – a successful accounting and business advisory practice based in Australia. But she’s becoming equally well known for her social media skills, having cracked the elusive combination of expertise, personality and value necessary to stand out. We spoke to Stacey to learn more about her business journey and to find out how she has used Receipt Bank to free up more time in her business to focus on growth, and delighting her customers. And of course we couldn't chat to an expert without getting a few of her social media top tips. How did you get started with bookkeeping? When I first started my focus was going to be mums in business since I’d just had two kids. Mums came to me saying they’d started a business and didn’t know what they were doing. However, I soon realised that mums aren’t always the ideal client type, so now I just look for those really care about their numbers. How were you getting hold of the data in those days? It was a very manual process for the first 18 months. In those days clients would give me a big folder of receipts, I’d take it home, and enter all the data. One factor that some people don’t think of is travel time, driving an hour to your client’s office and another hour back. And when you get home you find you’re missing a document anyway. When I got to the 18 month mark, I realised my income wasn’t reflecting how much time I was working. In a 7.5 day. I was working three days a week then, and I worked out that over those three days, I spent two hours a day on non-productive collection work. Tired of collecting data? Find out how you can build a profitable bookkeeping service on our weekly effortless bookkeeping webinar. How did you find Receipt Bank and what was the reception like? I found Receipt Bank at a Xero roadshow originally. When I introduced it to my clients, a lot of them didn’t know about it but I kept hearing the same thing – paper is one of the biggest stresses for small business. Now we include Receipt Bank in all our packages. Clients don’t want to pay for data entry, they want to pay for advice. With Receipt Bank, the clients still feel in control, because they upload the items. We make it clear what we expect them to do, and when we expect them to do it. How does this affect your work day to day? Lots of clients who want monthly reporting, which is easy when they’re uploading data regularly. This means when it comes to BAS time, we’re just doing BAS and not chasing up items from January. 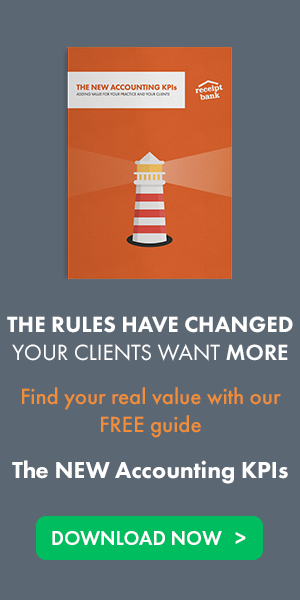 Do your clients feel the difference? Lots of my clients are in the process of building a business. That means they need to know if spending is getting out of control. I am always surprised at how many clients don’t look at their numbers, and don’t know if they’re profitable or why they’re not profitable. Receipt Bank helps change their mindset, and it’s important. Cashflow is the difference between being around in 12 months or not. It hasn’t always been easy. When first started on social, I thought that if I just show people my knowledge, they’ll be lining up at the door. I thought if I posted in-depth articles, they’d come. People didn’t respond - you can’t tell face or tone from a slab of text on technical topics. The end user just skips it, no matter how useful it is. So I brought it back to “Why am I on social media in my own life?” The things I stop and read are things that attract my eye. I want to know people’s story - I don’t just want to know that you’re an accountant, I want to know why. If I can get to know someone through social, I would work with them, because I’ve already got a connection. What results have you seen from your promotion on social media? 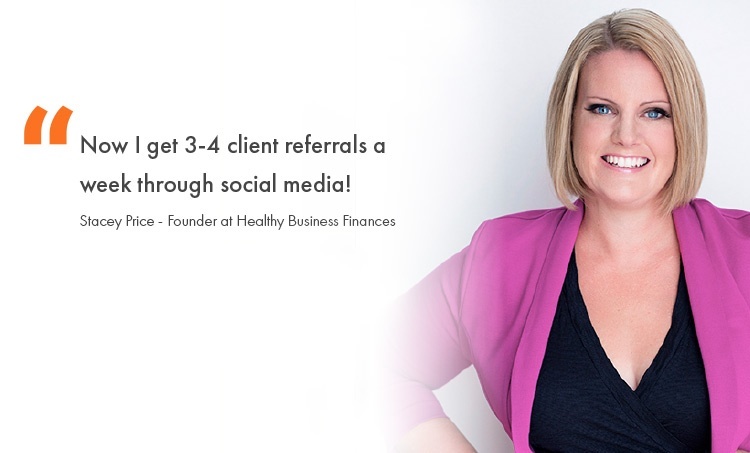 I now get 3-4 referrals a week through social media. Lot’s of them have specific queries, and I encourage them to book in session. For contrast, I get a contact through website maybe once a month. People message me and say “I followed you for 6 months, I feel like I know you”. What advice do you have for other accountants and bookkeepers trying to use social media? It really helps to do content in chunks, so it doesn’t take so long, and gives time to respond to content. People forget that conversations matters as much as content - if you don’t respond to the comment, it’s like ignoring someone in the street. If you start ignoring the people supporting you, that is your potential client you’re losing. Thanks very much to Stacey Price for talking to use about her business. If you want to learn more about how Receipt Bank can help your business save time and money, check out our weekly webinar.